The Boy Who Could Do What He Liked is the third children's book written by British comedian and author David Baddiel. His previous children's book bestsellers include The Parent Agency and The Person Controller. The Boy Who Could Do What He Liked follows the tale of Alfie, a boy who followed routines; routines his Dad writes for him on little notes. 11 year old Alfie knows no different, and follows his routines without question. That is, until the night his parents receive a call to say Alfie's usually babysitter won't be able to make it. As a last minute option, Alfie's Dad finds a number of a babysitter, scribbled onto a piece of paper by his late wife. In comes Mrs Stokes, a babysitter who a) is hard of hearing, b) is really old and c) hates routines. Alfie's newfound freedom is somewhat alien to his streamlined days, and when he does do what he likes things get a little kooky. This funny short story, makes kids question what might happen where there are no rules to follow. It's a sweet tale, touched by snippets of emotion related to the memories of Alfie's late mother. "It was incredible because of Fart Harbour, and it was very very funny"
If you want to know about Fart Harbour, you'll have to read the book! 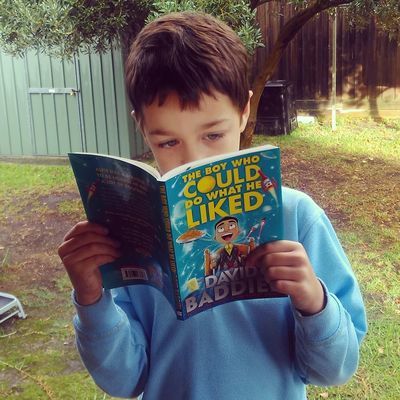 The Boy Who Could Do What He Liked by David Baddiel is published by Harper Collins, available to buy from all good books stores.